In the spirit of Thanksgiving and all of its cooking glory, today I am posting the three dishes I brought to our Thanksgiving feast. Thanks to the continuing generosity of Lynda and Tom, each year we have a warm, welcoming and delicious place to celebrate this holiday. This year I made a carrot cake (recipe here), this upside down cake, and some California-style stuffing (recipe here). The top of this cake is sweet and caramelized, the cake itself was best described by my sister Brittany as “tasting like a madeline.” The original recipe called for flaked coconut, which probably made this more of a coconut pineapple cake – but since Garren isn’t a fan of flaked coconut, and frankly you don’t need it – this turns out to be more pineapple tasting with the richness of coconut milk baked in. 2. 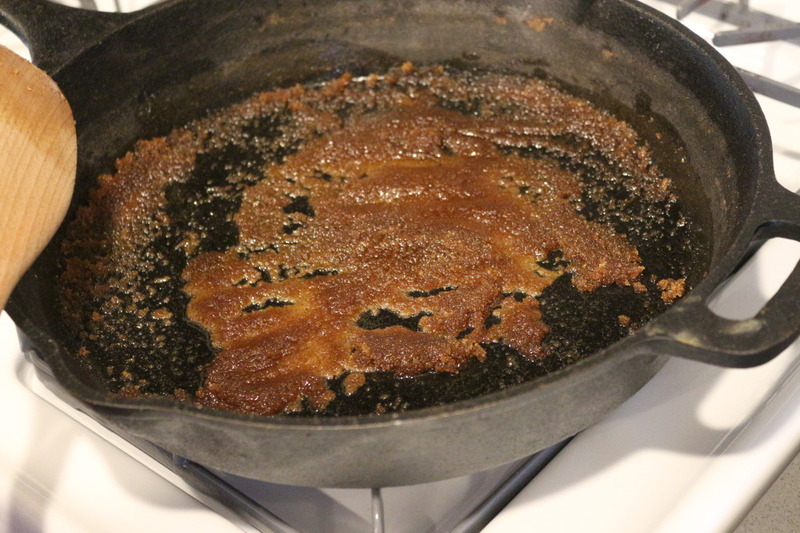 Heat the three tablespoons butter in your skillet over medium heat. Add the brown sugar and stir until melted. 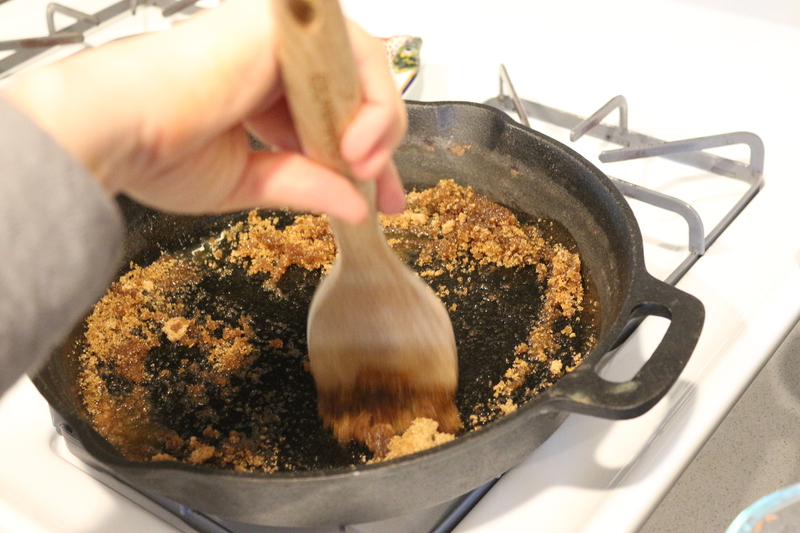 Remove from the heat and spread the caramel mixture across the entire bottom of the pan (this will eventually be the top of the cake when it’s done). 3. 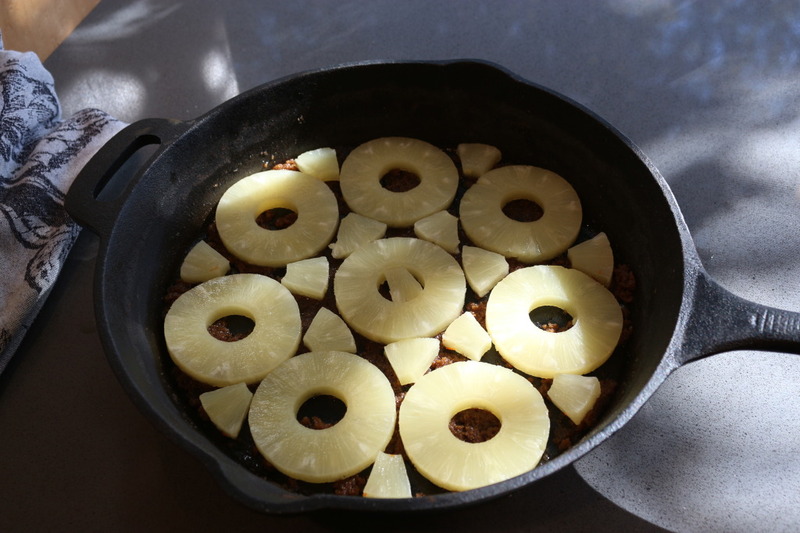 Arrange the pineapple slices so they cover the pan. Here is what I usually do (depicted below): Arrange the slices in a circle around the edge. Then, put a slice in the middle. Then cut the remaining slices in half, in half again, and in half again (so you have 8 pieces) and arrange them into the holes. 4. Beat the remaining stick of butter in a large mixing bowl until pale. Add the sugar and continue mixing until pale and fluffy. Add the eggs one at a time and beat to combine. Stir in the vanilla bean. (To scrape a vanilla bean, just grab a sharp knife, split it in half, then scrape out the beans – they will kind of stick together like black molasses until you mix them into the batter and then get that beautiful speckled look of vanilla bean). 5. In a separate bowl, stir together the flour, baking powder and salt with a fork. 6. 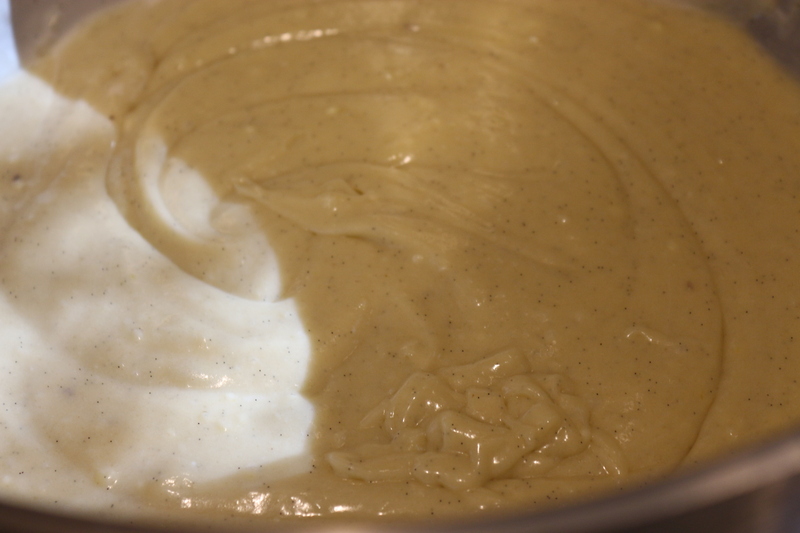 Working in batches, add some dry mixture to the butter/egg batter until combined. Then stir in some coconut milk. Follow by dry and then by coconut milk. Continue until all is combined (about four rounds). 7. Pour the batter over the pineapple and spread out evenly. Bake for 45 minutes until the top is golden and a knife inserted in the center comes out clean. 8. Allow to cool. When the cake has finished cooling, place a place underneath. 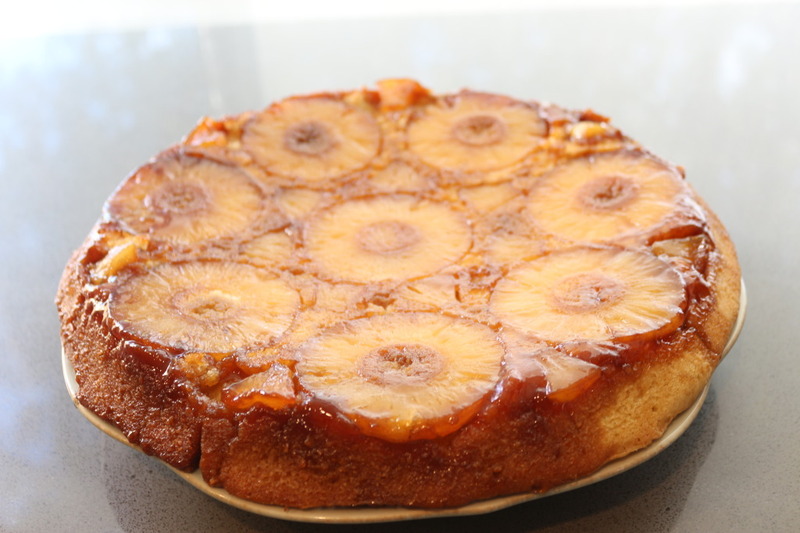 Invert the pan, tap it like a drum, and slowly lift it up to allow the cake to pull away. If there are any straggling pineapple pieces in the pan, just return them to the cake. 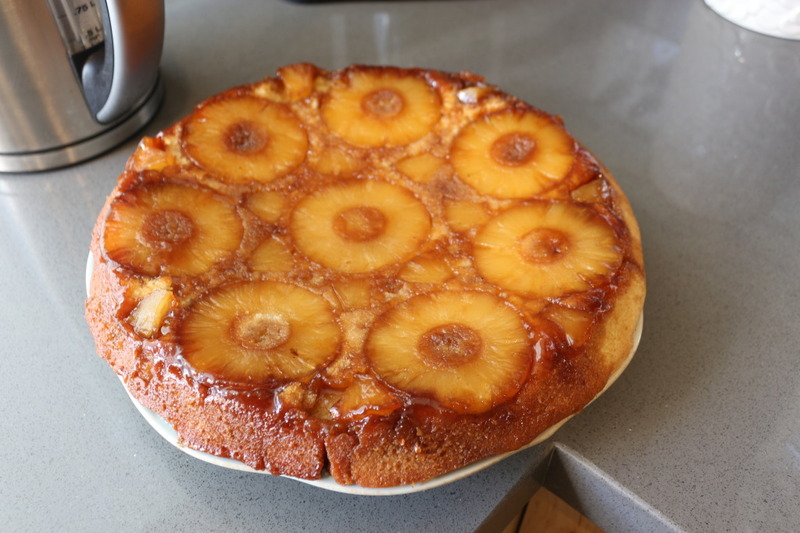 This entry was posted in Sweets and tagged coconut, FRUiT, Hawaiian Foods, PINEapple, Vegetarian. Bookmark the permalink.